Acclaim | Viviane Hagner | Kirshbaum Associates Inc.
"Her rich, burnished tone, crystalline articulation and subtle expression grab attention and leave a lasting impression... the 27 year-old violinist from Munich gave a spine-chilling recital, an almost hauntingly masterful display of technique and artistry." "Viviane Hagner proved to be a mighty soloist, unflinching and resolute as she powered through the most challenging of passages. There was a classic solidity about Hagner's playing which suited Beethoven's structured, four square work: she mapped out virtuosic passages with thrilling accuracy, hitting every high note and every chord in an impressive display of virtuosity, impassioned but not passionate." "Violinist Viviane plays with a brilliant richness of tone, emphasized by a very fast vibrato which gives a dark, viola-like headiness to the lower strings and real brightness to the upper ones." 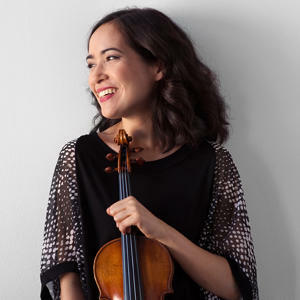 "At 24, German violinist Viviane Hagner is a superb artist whose recital Tuesday night at the Kennedy Center's Terrace Theater was surely just one more step toward a major career. She played with breathtaking assurance and originality and her command of the instrument is such that its production falls naturally and easily on the ear. When she wants, her tone has a beautifully centered luster, but she shades it constantly to assume the color and character of the music." "When she played, her instrument resonated with darkly hued tone - clean and solid. An unfettered synchronicity developed between soloist and orchestra. Cheers of 'brava' from a standing audience brought an encore of Bach's Chaconne from the Partita in D minor. Ringing harmonies sounded as her bow rocked quickly across the violin's bridge. Interpretative genius was evident as she developed purposeful phrases throughout the unaccompanied work." "Hagner's exquisitely expressive playing, coupled with her impressive technical command of her instrument, made this performance stunningly noteworthy. She exhibited a sensitivity to the nuances of the score that added depth and an extra dimension to the music. This was a performance of the highest caliber."